1. Place the asparagus tips into a pan of boiling water and cook for three to four minutes. 2. 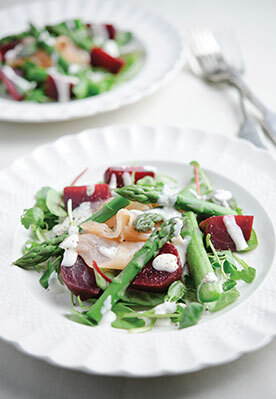 Meanwhile assemble the salad leaves and watercress onto two small plates and lay on the smoked salmon. 3. Add the beetroot. Then drain the asparagus tips and lay on top of the salad. 4. Finally mix the dressing ingredients together and drizzle over the salad with lots of black pepper over the top. Finish with the lemon juice.